Richard Pearce's "Heartland" is a big, robust, joyous movie about people who make other movie heroes look tentative. It takes place in 1910, out in the unsettled frontier landsof Wyoming, and it's about a determined young widow who packs up her daughter and moves out West to take a job as the housekeeper on a ranch. At first she is completely baffled by the rancher who has hired her ("I can't talk about anything with that man"), but in the end she marries him and digs in to fight an endless battle with the seasons, the land, and the banks. A movie newcomer named Conchata Ferrell plays the widow, Elinore Randall. She's a big-boned, clear-eyed, wide-hipped woman of about thirty who makes us realize that most of the women in Westerns look as if they're about to collapse under the strain. She is extremely clear about her motivations. She gives a full day's work for a full day's pay, but she is tired of working for others, and would like to own her own land someday. 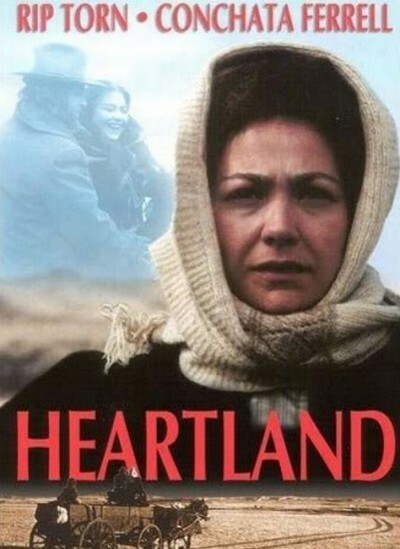 She does not, however, speak endlessly about her beliefs and ambitions, because Heartland is a movie of few words. That is partly because of the character of Clyde Stewart (Rip Torn), the rancher she goes to work for. He hardly ever says anything. He is a hard man, a realist who knows that the undisciplined Western land can break his back. But he is not unkind, and in the scene where he finally proposes to marry her, his choice of words contains understated wit that makes us smile. Everything in this movie affirms life. Perhaps that is why Heartland can also be so unblinking in its consideration of death. The American West was not settled by people who spent all their time baking peach cobbler and knitting samplers, and this movie contains several scenes that will shock some audiences because of their forthright realism. We see a pig slaughtered, a calf birthed, cattle skinned, and a half-dead horse left out in the blizzard because there is simply nothing to feed it. All of Heartland is stunningly photographed on and around a Montana ranch. (The movie is based on the real life of a settler named Elinore Randall Stewart.) It contains countless small details of farming life, putin not for "atmosphere" but because they work better than dialogue to flesh out the characters. The desolation of the frontier is suggested in small vignettes, such as one involving a family that could get this far and no farther, and lives huddled inside a small wagon. Among the many scenes that delight us with their freshness is one moment right after the wedding, when Ferrell realizes she got married wearing her apron and work boots, and another when she is about to give birth and her husband rides off into the storm to fetch the midwife from the next farm. We settle back here in anticipation of the obligatory scene in which the midwife arrives and immediately orders everyone to boil hot water, lots of it but this time we're surprised. The husband returns alone; the midwife was not at her farm. Quiet little developments like that help expose the weight of clichés that holds down most Westerns. In a movie filled with wonderful things, the very best thing in Heartland is Conchata Ferrell's voice. It is strong, confident, clear as a bell, and naturally musical. It is a fine instrument, bringing authenticity to every word it says. It puts this movie to a test, because we could not quite accept that voice saying words that sounded phony and contrived. In Heartland, we never have to.